Background and objectives Observational evidence has suggested that RRT modality may affect recovery after AKI. It is unclear whether initial choice of intermittent hemodialysis or continuous RRT affects renal recovery, survival, or development of ESRD in critically ill patients when modality choice is made primarily on hemodynamics. Design, setting, participants, & measurements We performed a retrospective cohort study examining adults (≥18 years old) admitted to intensive care units from 2000 to 2008 who received RRT for AKI and survived to hospital discharge or 90 days. We analyzed renal recovery (alive and not requiring RRT) and reasons for nonrecovery (death or ESRD) at 90 and 365 days. Conditional multivariable logistic regression was used to assess differences in renal recovery at 90 and 365 days between continuous RRT and intermittent hemodialysis. Models were stratified by propensity for continuous RRT and adjusted for age and reference creatinine. Results Of 4738 patients with Kidney Disease Improving Global Outcomes stage 3 AKI, 1338 (28.2%) received RRT, and 638 (47.7%) survived to hospital discharge (353 intermittent hemodialysis and 285 continuous RRT). Recovery from AKI was lower for intermittent hemodialysis versus continuous RRT at 90 days (66.6% intermittent hemodialysis versus 75.4% continuous RRT; P=0.02) but similar at 365 days (54.1% intermittent hemodialysis versus 59.6% continuous RRT; P=0.17). In multivariable analysis, there was no difference in odds of recovery at 90 or 365 days for patients initially treated with continuous RRT versus intermittent hemodialysis (90 days: odds ratio, 1.19; 95% confidence interval, 0.91 to 1.55; P=0.20; 365 days: odds ratio, 0.93; 95% confidence interval, 0.72 to 1.2; P=0.55). Conclusions We found no significant difference in hazards for nonrecovery or reasons for nonrecovery (mortality or ESRD) with intermittent hemodialysis versus continuous RRT. These results suggest that, when initial RRT modality is chosen primarily on hemodynamics, renal recovery and clinical outcomes in survivors are similar between intermittent hemodialysis and continuous RRT. AKI is common in critically ill patients and associated with high morbidity and mortality (1,2). Worldwide, >13% of patients in the intensive care unit (ICU) receive RRT for AKI (3). For such patients, 90-day survival is approximately 50%, and dialysis dependence at 90 days is roughly 21% (4). Multinational studies have shown that premorbid renal dysfunction is common, and sepsis is the dominant cause of AKI (2,3). RRT in the ICU is typically provided as continuous RRT (CRRT) or standard intermittent hemodialysis (IHD); alternatives (e.g., peritoneal dialysis or hemodialysis in slow extended treatments ) are used in some centers in the United States but remain uncommon. The choice of RRT modality is generally guided by a patient’s hemodynamic status. CRRT is used as the initial modality when patients are hemodynamically unstable (6). This approach is used in most large-center ICUs in the United States as per the Kidney Disease Outcomes Quality Initiative and Kidney Disease Improving Global Outcomes (KDIGO) clinical practice guidelines for AKI (7,8). Both CRRT and IHD achieve adequate metabolic control, but neither modality has been shown to be superior in terms of survival (9–19). However, some studies suggest that the choice of initial RRT modality may affect renal recovery and dialysis dependence after AKI, which may have implications for patients, their families, and health care systems in terms of survival, quality of life, and costs (18–20). A recent systematic review and meta-analysis of 23 studies (seven randomized, controlled trials [RCTs] and 16 observational studies) analyzed whether there is an increased hazard associated with IHD compared with CRRT in renal recovery and dialysis dependence (i.e., progression to ESRD) (1). The pooled analysis of these observational studies showed a higher rate of dialysis dependence among survivors who initially received IHD versus CRRT (relative risk, 1.99; 95% confidence interval [95% CI], 1.53 to 2.59; I2=42%). However, the RCTs showed no difference in rate of dialysis dependence among survivors (relative risk, 1.15; 95% CI, 0.78 to 1.68; I2=0%). In a large observational study published after this meta-analysis, Wald et al. (4) reported that CRRT, compared with IHD as the initial modality of RRT in critically ill adults with AKI, is associated with a lower likelihood of chronic dialysis (hazard ratio [HR], 0.75; 95% CI, 0.65 to 0.87). However, observational studies are prone to allocation bias, even after multivariate adjustment. Thus, we aimed to examine the adverse effects from IHD compared with CRRT as initial choice of RRT modality (delivered in accordance with the KDIGO guideline ) and if modality has any effect on clinical outcomes (recovery, dialysis dependence, or mortality). The High-Density Intensive Care 8 (HiDenIC-8) database includes data on a source population of 45,568 adult patients admitted to an ICU within a single tertiary care academic medical center (University of Pittsburgh Medical Center [UPMC]) during an 8-year period (July of 2000 to October of 2008). For this study, we applied the following exclusion criteria: history of chronic dialysis and/or renal transplant, baseline creatinine ≥4 mg/dl, liver transplant during the index hospitalization, history of heart failure (on the basis of International Classification of Diseases-9 [ICD-9] codes), insufficient information to determine AKI status, no stage 3 AKI during hospitalization, KDIGO stage 3 AKI not requiring RRT, and mortality at hospital discharge censored at 90 days (i.e., if 90 days after hospital admission, patients were not yet discharged, we considered them as hospital survivors, regardless of their hospital mortality on and after day 91). The remaining 638 patients comprised the study cohort (Figure 1). Population flowchart. CRRT, continuous RRT; IHD, intermittent hemodialysis; KDIGO, Kidney Disease Improving Global Outcomes. After obtaining institutional review board approval, we deidentified data obtained from several computerized databases by using an honest broker. Data on all patients admitted to an ICU at the UPMC from July of 2000 to October of 2008 are included. Details of this database have been published previously (21,22). Before deidentification, the honest broker obtained information from the US Renal Data System (23) and the National Death Index (24). Information on postdischarge mortality and RRT status is included in the HiDenIC-8 database. We stratified patients into two cohorts: those initially treated with IHD and those initially treated with CRRT. We classified race as white, black, or other/unknown. Comorbid conditions and medical/surgical admissions were determined by ICD-9 codes. Baseline, admission, and reference serum creatinine values were determined as previously described (21,25,26). Definitions of these values are given: baseline serum creatinine is the lowest value between the most recent prehospital serum creatinine up to 1 year before the index hospital admission and the serum creatinine recorded in the first 24 hours of hospitalization, admission creatinine is the serum creatinine recorded in the first 24 hours, and reference creatinine is the baseline creatinine when available (otherwise, the lowest between the admission creatinine, the serum creatinine recorded in the first 24 hours of ICU admission, and for patients without a history of CKD, the serum creatinine back-calculated from the Modification of Diet in Renal Disease Study equation assuming an eGFR of 75 ml/min per 1.73 m2). Serum creatinine was measured in the hospital clinical laboratory using an enzymatic assay (VITROS 950; Ortho Clinical Diagnostics). A computerized severity score (CSS) was computed from HiDenIC-8 using all physiologic and chronic health variables in the Acute Physiologic and Chronic Health Evaluation (APACHE) III score as described (25,27–29), assuming normality when values were missing. To derive the CSS, component variables accrued over the first 24-hour window after ICU admission contributed points to severity according to the APACHE III point schema. To quantify the severity of hypotension, we calculated a hypotensive index that integrates the duration and depth (essentially the area under the curve) of systolic BP<90 mmHg in the first 24 hours after ICU admission or the 24 hours before RRT initiation (30). Because sepsis is under-reported with ICD-9 codes, we defined suspected sepsis as the ordering of blood cultures and antibiotics within 24 hours of each other. We analyzed differences in renal recovery as well as reasons for nonrecovery at 90 and 365 days after RRT was initiated. Renal recovery was defined as being alive and not on RRT by either 90 or 365 days after RRT was initiated. Reasons for nonrecovery were death or ESRD at 90 or 365 days after RRT was initiated. We combined both severity of hypotension and vasopressor use to stratify patients as either hemodynamically unstable or stable. Patients with either a systolic BP<90 mmHg or any use of vasopressors during the 24 hours before RRT were classified as hemodynamically unstable, and the remaining patients, who had no systolic BP values <90 mmHg and no use of vasopressors during the 24 hours before RRT, were classified as hemodynamically stable (30). Statistical analyses were performed using the STATA software, version SE 11.2 (StataCorp., College Station, TX), with statistical significance set at P<0.05. Comparisons across RRT groups were performed using Fisher exact test for categorical variables and Kruskal–Wallis one–way ANOVA by ranks for continuous variables. To determine the propensity for CRRT, we conducted multivariable logistic regression in all patients on RRT. All risk factors from Table 1, except for body mass index, were used to determine the propensity for CRRT. We assessed the balance in baseline covariates between patients on CRRT and patients on IHD in each quintile of the propensity for CRRT. Next, we used conditional logistic regression with robust SEMs to assess differences in recovery from first RRT modality at 90 and 365 days after RRT initiation between patients on CRRT and patients on IHD. These models were stratified by quintiles of the propensity for CRRT and adjusted for age and other baseline covariates that showed imbalance between patients on CRRT and patients on IHD. Wald tests were used to determine baseline covariates that had significance levels <0.05, and the likelihood ratio test was used to make comparisons between models. Finally, we performed univariate analyses in the subgroups of hospital survivors who were hemodynamically unstable (n=345) and hemodynamically stable (n=292) to determine whether there was an association between initial RRT modality, kidney recovery, and clinical outcomes in these subgroups. Of 45,568 patients included in the source population, 20,984 developed AKI. Of these, 1338 received RRT (6.4% of patients with AKI). Seven hundred patients (52.3%) died before hospital discharge (censored at 90 days; 31% for patients receiving IHD and 69% for patient receiving CRRT as initial modality). The remaining 638 (47.7%) were alive at hospital discharge (censored at 90 days) and comprised the study population; 353 of these patients (55.3%) received IHD and 285 (44.7%) received CRRT as their initial modality of RRT (Figure 1). Baseline characteristics of the study cohort showed that patients receiving CRRT were younger (P<0.01) and had lower reference serum creatinine (median [quartile 1 to quartile 3]: 1 [0.8–1.2] mg/dl versus 1 [0.8–1.4] mg/dl; P=0.02) (Table 1). As expected, patients who received CRRT as their initial modality of RRT were more severely ill as evidenced by higher CSS: they had greater severity of hypotension on day 1, larger volumes of intravenous fluid administration, higher rates of suspected sepsis, and greater use of vasopressor support and mechanical ventilation (all P<0.05) (Table 1). Table 2 shows the logistic regression model for modality of RRT (CRRT versus IHD), which formed the basis of the propensity score used in the conditional multivariable logistic regression for recovery from RRT measured at 90 and 365 days from initiation of RRT. Age, chronic renal disease, reference creatinine, KDIGO stage 3 before RRT, severity of hypotension, fluid administration, suspected sepsis, and vasopressor use were all significantly associated with CRRT use (all P<0.05) (Table 2). 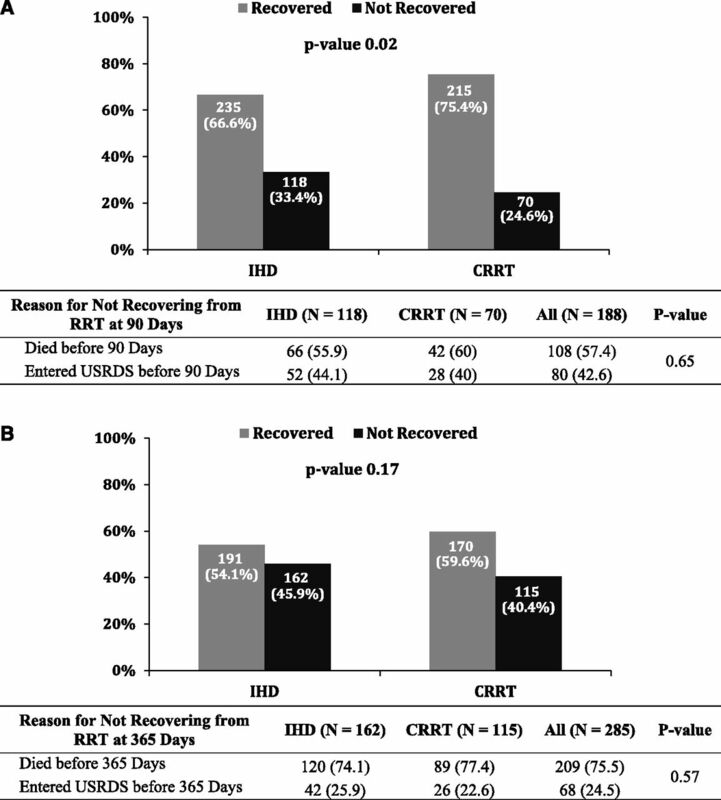 Recovery at 90 days from the initiation of RRT was lower in patients initially treated with IHD compared with those initially treated with CRRT (66.6% IHD versus 75.4% CRRT; P=0.02) (Figure 2A); however, there was no difference in recovery at 365 days between the two groups (54.1% IHD versus 59.6% CRRT; P=0.17) (Figure 2B). An unadjusted analysis showed no difference between patients treated initially with either IHD or CRRT in the reasons for nonrecovery at 90 days (death: 55.9% IHD versus 60% CRRT; ESRD: 44.1% IHD versus 40% CRRT; P=0.65) (Figure 2A) or 365 days (death: 74.1% IHD versus 77.4% CRRT; ESRD: 25.9% IHD versus 22.6% CRRT; P=0.57) (Figure 2B). In multivariable analysis, there was no difference in the odds for recovery from first RRT modality at 90 or 365 days for patients initially treated with CRRT compared with IHD (90 days: odds ratio [OR], 1.19; 95% CI, 0.91 to 1.55; P=0.20; 365 days: OR, 0.93; 95% CI, 0.72 to 1.2; P=0.55). Recovery from AKI at 90 days and 1 year. Panel (A) shows renal recovery rates for hospital survivors at 90 days from RRT initiation. Panel (B) shows renal recovery rates for hospital survivors at 365 days from RRT initiation. CRRT, continuous RRT; IHD, intermittent hemodialysis; USRDS, US Renal Data System. Examining the entire RRT cohort (1334 patients; four patients could not have their severity of hypotension assessed), 454 (34%) were hemodynamically stable, and the remaining 880 (66%) were unstable (Figure 3). Among hemodynamically stable patients, the majority (83.3%) received IHD as initial RRT modality, whereas among hemodynamically unstable patients, the majority (78.4%) received CRRT as initial RRT modality. Examining the study cohort (637 patients; one patient could not have the severity of hypotension assessed), 292 (45.8%) were hemodynamically stable, and the remaining 345 (54.2%) were unstable. Among hemodynamically stable patients, the majority (86%) received IHD as initial RRT modality, whereas among hemodynamically unstable patients, the majority (70.7%) received CRRT as initial RRT modality. Also, 19.7% of patients initially started on IHD moved to CRRT, whereas 33% initially started on CRRT moved to IHD at some point during their hospitalization. Exploratory analysis of hemodynamic instability 24 hours before RRT. CRRT, continuous RRT; IHD, intermittent hemodialysis; KDIGO, Kidney Disease Improving Global Outcomes. Of those patients who survived hospital discharge censored at 90 days, there were 292 (45.8%) hemodynamically stable and 345 (54.1%) hemodynamically unstable patients. For hemodynamically stable patients, renal recovery at 90 and 365 days was not significantly different between those receiving CRRT compared with those receiving IHD initially (168 of 251 [66.9%] IHD versus 29 of 41 [70.7%] CRRT; P=0.72 at 90 days; 137 of 251 [54.6%] IHD versus 20 of 41 [48.8%] CRRT; P=0.50 at 365 days). For hemodynamically unstable patients, renal recovery at 90 days was greater in those receiving CRRT (66 of 101 [65.3%] versus 186 of 244 [76.2%]; P=0.05); however, recovery at 365 days was not different (53 of 101 [52.5%] versus 150 of 244 [61.5%]; P=0.15). Reasons for nonrecovery at 90 and 365 days in either hemodynamically stable or unstable patients did not differ on the basis of initial RRT modality. RCTs have not shown differences in important clinical outcomes after AKI between those who receive IHD versus CRRT as initial RRT modality (4,15–19,31–33). However, several of these trials had limitations, including small sample sizes, inability to control for major clinical decisions, and inability to control for other supportive management strategies that affect outcomes in AKI (e.g., nutrition support, hemodynamic support, timing of initiation of RRT, and dose of dialysis) (4,25,27). Previous observational studies have suggested that initial modality of RRT may affect renal recovery in AKI, with a higher rate of dialysis dependence seen among survivors who initially received IHD versus CRRT (1,4,34–50). These discrepant findings could be caused by inherent biases in observational studies that are not present in RCTs, such as imbalances between groups and differential mortality rates. Most ICUs select CRRT or IHD on the basis of patient characteristics, especially hemodynamic status. Therefore, the gap in knowledge that we sought to address is not whether IHD and CRRT lead to divergent outcomes when used for all patients but rather, whether the current approach to modality selection primarily on the basis of hemodynamics is associated with a long-term hazard for IHD. Thus, using a database of all adult patients admitted to the ICUs at a single academic medical center from July of 2000 to October of 2008, we examined whether there is an adverse effect of IHD compared with CRRT as the initial modality of RRT on clinically important long–term outcomes. Although there is a difference in crude recovery rates at 90 days favoring CRRT, this difference does not persist after stratifying on the propensity for CRRT and adjusting for age and reference creatinine. Furthermore, no differences are observed in either crude or adjusted recovery rates at 1 year. The KDIGO guideline states that CRRT and IHD are complementary therapies (5.6.1) and suggests that CRRT be used for hemodynamically unstable patients (5.6.2) and patients with acute brain injury or other causes of increased intracranial pressure (5.6.3) (7,8). In exploratory analyses, we determined that initial RRT modality is chosen primarily on the basis of hemodynamic status. However, 21.6% of unstable patients received IHD, and 16.7% of stable patients received CRRT. This modality choice was likely attributable to individual variation in select patients. For instance, CRRT may have been started early for volume control in patients for whom there was an anticipation of hemodynamic intolerance (e.g., in a postsurgical setting). Conversely, IHD is sometimes used in patients who met our criteria for hemodynamic instability but in whom the clinical team feels will tolerate it (e.g., a patient on low-dose pressors who appears very stable). This may also be true when RRT is started primarily for electrolyte disturbances (e.g., hyperkalemia), in which volume removal is not necessary, and therefore, IHD could be carried out with no ultrafiltration. In exploratory analysis, we found that, in hemodynamically unstable patients, differences in renal recovery were seen at 90 days, but by 1 year, these were no longer significant. In hemodynamically stable patients, there were no differences in renal recovery at either time point. These findings suggest that any observed advantages for CRRT are limited to hemodynamically unstable patients, are short lived, and do not persist after controlling for baseline variables. Of note, in a prospective randomized trial comparing CRRT versus IHD in patients with multiorgan dysfunction (30), the majority of patients in both arms were hemodynamically unstable, but no differences in survival or renal recovery were observed. A recent large retrospective matched cohort study of critically ill patients who survived for 90 days after an episode of AKI and were treated with RRT (2004 recipients of CRRT matched to 2004 recipients of IHD) showed that the risk of chronic dialysis was significantly lower among patients who received CRRT versus IHD (HR, 0.75; 95% CI, 0.65 to 0.87). This association was particularly prominent among those with preexisting CKD (OR, 0.57; 95% CI, 0.44 to 0.73; P=0.07 for interaction) and heart failure (OR, 0.54; 95% CI, 0.41 to 0.72; P=0.04 for interaction) (4). Sensitivity analyses showed that CRRT remained associated with a lower risk of chronic dialysis, even after recategorizing the exposure as any CRRT versus exclusive receipt of IHD (HR, 0.80; 95% CI, 0.69 to 0.93). In addition, risk of dialysis dependence remained lower with CRRT with follow-up commencing at the time of acute RRT initiation rather than after the 90-day survival period as well as in analyses in which death was treated as a competing risk for chronic dialysis. CRRT was associated with increased mortality during the first 90 days but not after day 90. Among 1343 patient pairs who were alive and independent of dialysis at 90 days, there was no increased hazard for progression to chronic dialysis (HR, 0.91; 95% CI, 0.63 to 1.33) or all-cause mortality (HR, 1.05; 95% CI, 0.90 to 1.22) (4). Although this study used rigorous methodology to match recipients of CRRT to recipients of IHD, there remains a risk of residual confounding caused by unmeasured variables. In addition, this study could not ascertain the total exposure to either CRRT or IHD in those who transitioned between both modalities on the basis of hemodynamic status (i.e., those who received both CRRT and IHD during the course of their hospitalization). Furthermore, this study did not have data on serial BP measurements or vasopressor use from the index hospitalization. Therefore, it was unable to determine a mechanism for the relationship between CRRT and lower risk for chronic dialysis (4). Our study was a large retrospective analysis of critically ill patients who survived to hospital discharge after an episode of AKI and were treated with RRT comparing renal recovery and dialysis dependence on the basis of initial RRT modality. However, our findings (19) are different from those of Wald et al. (4) as well as many of the previous observational studies (1,34–50). Instead, our findings are more consistent with previous RCTs (1,15,16,30–32,51,52). It is unclear why our findings diverge from other large retrospective studies and show no increased hazard for nonrecovery from AKI with IHD. We speculate that our findings may reflect a practice of initiating CRRT predominantly on the basis of hemodynamics. Our findings suggest that, when modality is applied in this way, IHD and CRRT result in very comparable long–term outcomes. Our study has several strengths, including the use of a large database drawn from multiple sources that contained detailed data on comorbidities, serum creatinine, urine output, RRT initiation, and long-term outcomes, such as mortality and ESRD. It was also strengthened by the use of a propensity score to balance the clinical characteristics between those receiving CRRT and those receiving IHD as a first modality. However, our study has similar limitations to those of other observational studies, including potential for residual confounding. Because modality choice is determined by hemodynamics, we could not achieve a valid comparison between patients who were hemodynamically stable and those who were unstable. Therefore, we report only exploratory analyses regarding the hemodynamic stability between the two groups. In addition, although it would have been better to define hypotension by identifying each patient’s baseline BP and stratifying patients on the basis of hypotension with respect to their baseline BP, these data were not readily available from the database. Another limitation was the lack of a standard definition for renal recovery that accounts for the true extent of the recovery in terms of functioning nephrons, which may vary considerably from patient to patient. Instead, we were only able to determine recovery as the cessation of dialysis. Finally, we could only describe the hemodynamic status before commencing dialysis and did not study the consequences of dialysis on BP after it was commenced. It is possible that additional episodes of hypotension during either modality would be detrimental to long-term recovery of the kidneys. Generalizability to patients hospitalized in other centers is uncertain, and given that even our adjusted analyses suggested a trend favoring renal recovery with CRRT, it is possible that the actual benefits of CRRT were rendered unapparent because of limited power resulting from the relatively small sample size. 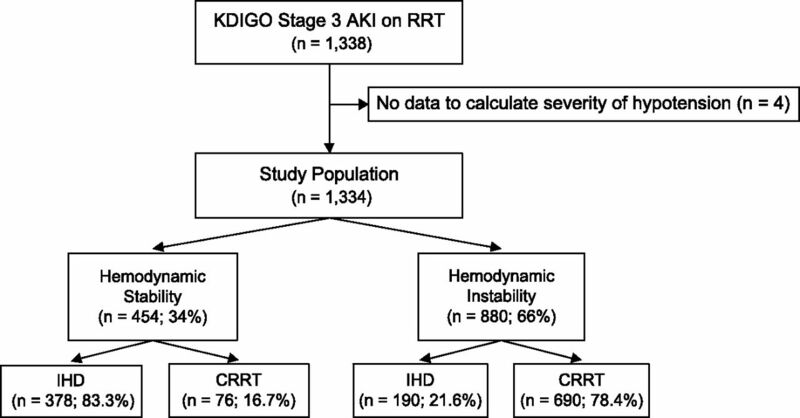 In conclusion, our study shows that, in patients in the ICU with KDIGO stage 3 AKI receiving RRT who survived to hospital discharge, there is no significant difference in hazards for nonrecovery from AKI at 365 days and similar rates of postdischarge mortality and ESRD at 90 and 365 days in those receiving IHD compared with CRRT as initial modality. Patients with CRRT were much more unstable (on the basis of hypotension and vasopressor use) compared with IHD. Therefore, a strategy that deploys both CRRT and IHD, mainly on the basis of hemodynamics, as per KDIGO guidelines, resulted in similar renal recovery among hospital survivors after adjusting for propensity for CRRT and other covariates in this critical care population. J.A.K. reported receiving consulting fees and research funding from Gambro/Baxter, Waukegan, IL. All other authors report no relevant financial interests, activities, relationships, or affiliations involving the work under consideration. Because P.M.P. is a Deputy Editor of the Clinical Journal of the American Society of Nephrology, he was not involved in the peer-review process for this manuscript. Another editor oversaw the peer-review and decision-making processes. We acknowledge the Project Manager, Nicole Lucko, and the entire Clinical Research, Investigation, and Systems Modeling of Acute Illness Center team. This work was supported by Gambro/Baxter, Waukegan, IL.